The clinic of Horror has a new employee among all the already existing doctors. 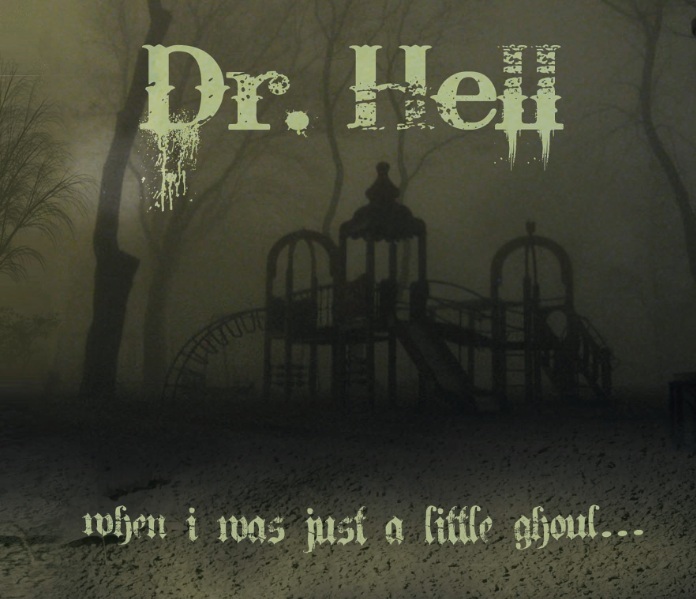 The name is Dr. Hell: A very young band from Germany with three guys and one girl. And in may of this year, they released their debut called When I Was Just A Little Ghoul. The bandname and the title of their album made me think of that cliché horrorpunk that is being produced daily. I have to admit, I was wrong. ’Cause these guys are somewhat of a fresh breeze in this scene where too many bands sound the same and take it all so serious. It’s not fantastic, it’s not all new but… They understand what the word punk is in horrorpunk. When I Was Just A Little Ghoul is a good soundtrack for having a rocking time at the graveyard. It doesn’t take long to realize that when you listen to it. After a creepy intro, the cd opens up with a presentation of the band that is called Death. Here is where you can tell that the four doctors play European punk. And they want to party. The vocals do not have that typical howling sound to it, and they are out of tune here and there. But then again, this is punk and it definitely fits to what these guys are doing. For example the song Undead that definitely reminds the listener of Pennywise. Or the song called Cannibalism, that is a pure punkrock song with influences from The Clash. They’ve come up with some fun lyrics to their songs as well. They even have a song about Kenny from South Park, and how he has to die in every episode. Talking about fun lyrics, their song Vampires has to win a prize. The chorus of the track goes “Vampires don’t glitter in the sun…”. I literally laughed out loud when I first heard it. Finally someone made a song about the movie that is going on most horrormovie fans nerves. Brilliant! Besides of that there are some nice guitar riffs here and there, especially in the song called Demons. A tune that sounds completely different from anything else on their record is Monsters that must have been influenced by the german punkband Wizo. I don’t know how to describe it, but it’s fun, it’s weird and you can definitely picture ghouls and monsters walking down the street, drunk as hell singing along to this one. Their debut includes 15 tracks and an intro. No title is longer than one word. It’s a fun debut that tells the listeners all about how this band rolls. There is not one single ballad on it. It’s all about having fun, drinking a beer or one too many and party. If there wouldn’t be any horror-lyrics in their songs and they wouldn’t wear any cliché face paint, it would be a pure fun-punk album. But they have all horror based lyrics and they present it in their own way. I don’t think there is one song on this album that wasn’t written with a smile. But there are not only punk influences. In my opinion there are some Misfits and Nim Vind influences to a few songs as well. When I Was Just A Little Ghoul is not an awesomely produced cd, but it definitely is a good party record. Well, and in the end, they don’t promise you an eerie trip to their batcave. “They are the doctors from hell, if you feel bad they’ll do it well”!